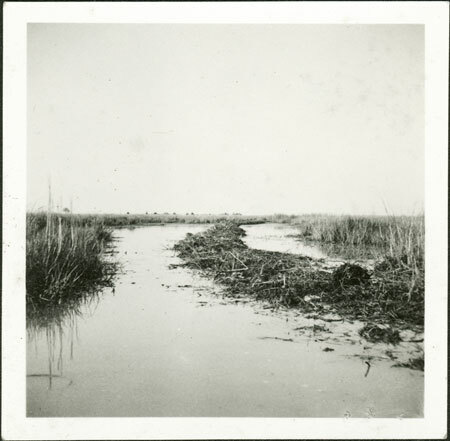 A river channel with swamp and reeds either side, probably a tributary of the Bahr-el-Ghazal in western Nuerland. Along the water course can be seen a lenght of vegetation known in arabic as sudd, which often blocks river flows causing more flooding. Note on print reverse ms pencil - "1 W. Nuer"
Morton, Chris. "Swamp in western Nuerland" Southern Sudan Project (in development). 03 Jan. 2006. Pitt Rivers Museum. <http://southernsudan.prm.ox.ac.uk/details/1998.346.217.2/>.